I’m something of a slow-starter when it comes to getting things done, so Tamagetitdone is right up my alley. Long story short, it’s a Chrome extension that aims to improve your productivity by slowly removing distractions from the time-sucking websites you frequent. And how does it do that? 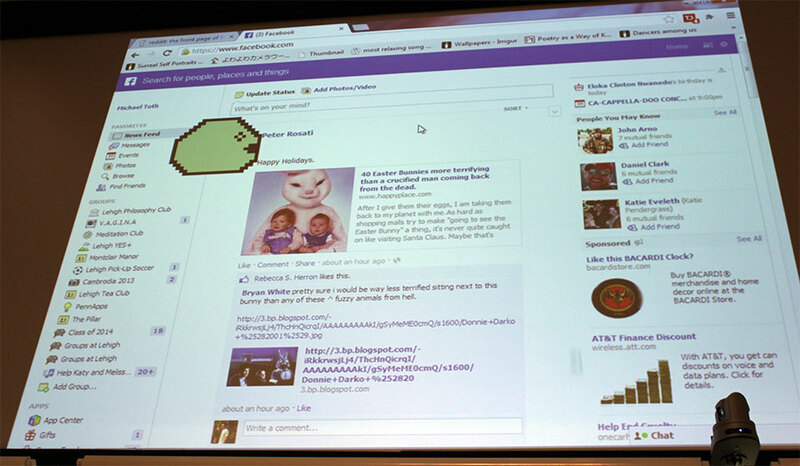 In case the name didn’t tip you off, a Tamagotchi lookalike follows your mouse cursor around and eats elements off the page to keep you from getting too side-tracked — you can fiddle with its hunger tolerance too so it doesn’t devour the contents of your Facebook news feed when you’re browsing during your downtime. 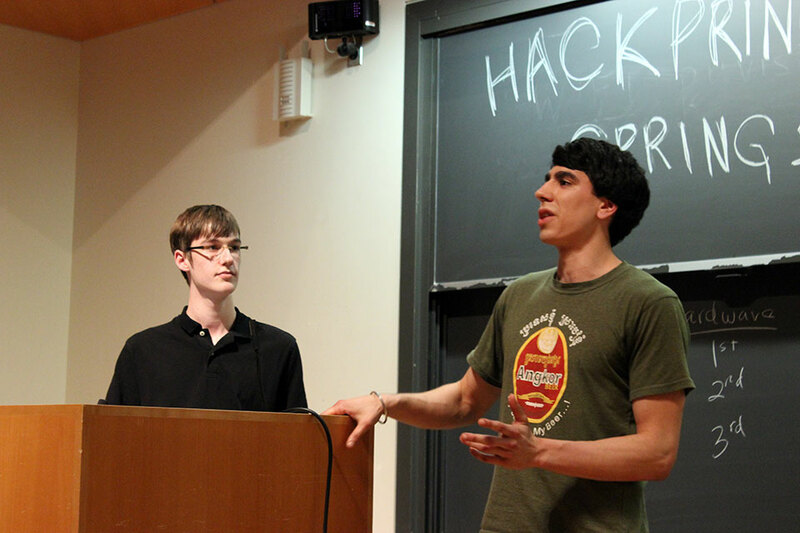 As it happens, the team behind Tamagetitdone is no stranger to the Hackathon scene — Lehigh University’s Greyson Parrelli, Ben Chen, and Michael Toth also developed the SparkTab project that John was so fond of at the PennApps Hackathon. The trio had to settle for second back at PennApps, but this time around they picked up first prize in the software division — a cool $1,000. Meanwhile, a project called InstantKarma sought to remove all the guesswork from racking up worthless Internet points on Reddit. Created by Kyle Dhillon (Princeton) and Ned Williamson (Carnegie Mellon), InstantKarma is a program that monitors Reddit’s new submissions and analyzes them to determine which are most likely to become popular (and by extension, which ones you should comment on). Can’t come up with a witty riposte of your own? The program can also tell if a particular submission is a repost, and displays comments that did well the last time for easy recycling. A group of Yale undergrads on the other hand cobbled together their own spin on the email read receipt. Jonathan Chang, John Maheswaran, Charles Jin, Mike Wu, and Frank Wu churned out a service called SeeMail, which alerts email senders when their missive has been read thanks to an image that gets embedded in the email’s signature. Once you’ve signed up for SeeMail, you punch in the names of your intended recipients on the SeeMail page, and it generates a snippet that you text into your email client of choice. After that you compose and send the email as usual — when the recipient opens said email, the SeeMail status page automatically updates to reflect the status change. According to Frank Wu the service is geared more toward curious individual users than for those who managed massive mailing lists, but SeeMail seems to work like a charm despite its humble origins. 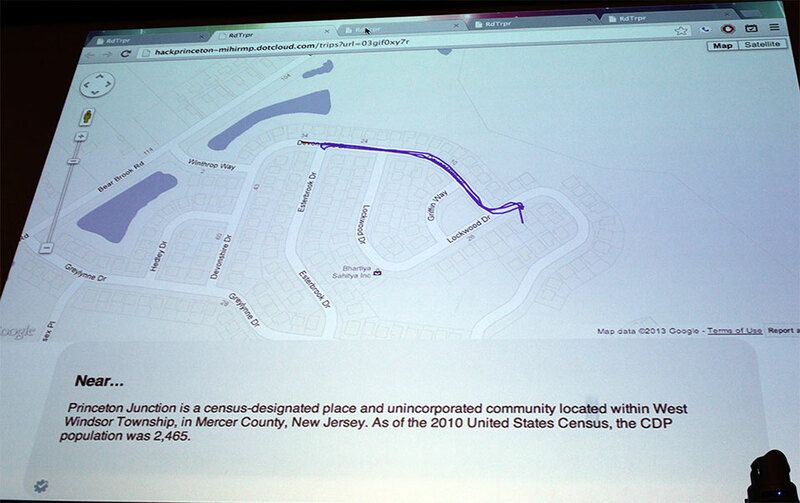 One of the most promising hacks at HackPrinceton was Rd Trpr (pronounced “road tripper”), created by vowel-averse Carnegie Mellon students Siddharth Dhulipalla, William Duff, Atharv Vaish, Mihir Pandya, and Vijay Thurimella. The service is comprised of two parts: an Android application that tracks your location when you head out on road trips, and a web app that displays your location to friends and family once you provide them with a link Rd Trpr automatically generates. To top it all off, Rd Trpr also collects and displays information about landmarks and local attractions near your current location, just to make sure that your trip is as eventful as possible. It’s still early days for the service, but it certainly seems to work — you can see the route the Rd Trpr took to get back to CMU here. With enough polish I could definitely see it picking up some steam down the road (sorry, couldn’t resist). 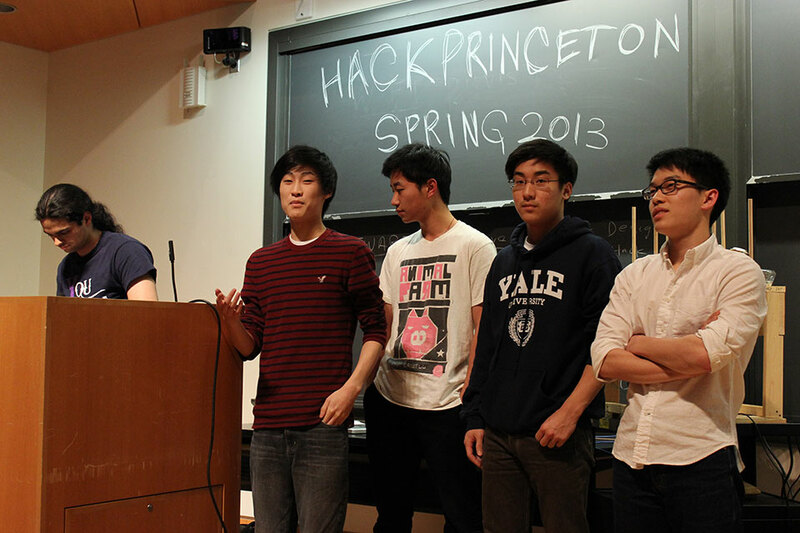 To my surprise (and delight), there were a handful of promising hardware hacks too thanks to HackPrinceton’s approach to reimbursing costs. 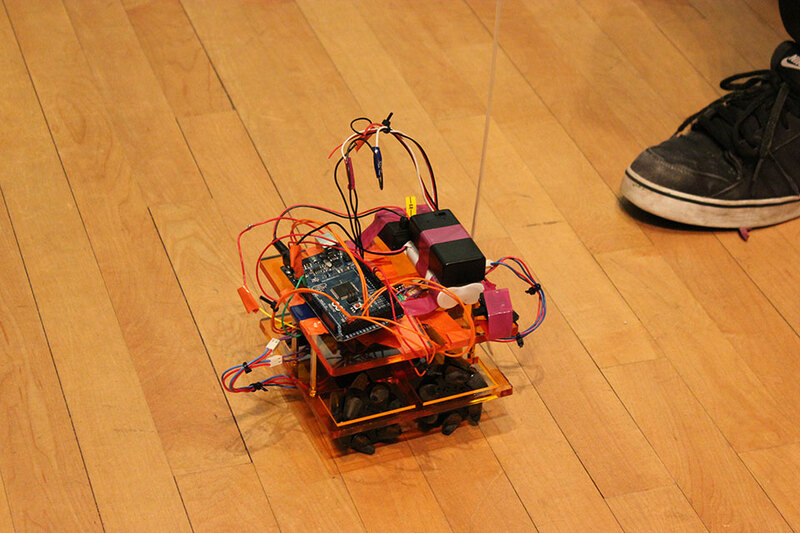 Drawing Robot, developed by Princeton’s Neil Chatterjee, Joseph Bolling, Ankush Gola, and Pranav Badami, was far and away one of the crowd’s favorites that night. It’s not hard to see why — the four-person team whipped together an Arduino-powered rover about the size of a soccer ball that would slavishly follow a user-defined course. The kicker? The “navigator” would create that course by tracing one out in mid-air, which a Microsoft Kinect would interpret. The team took a photo of the demo area from above that acted as a canvas of sorts — from there, the user could position a wireframe avatar of himself on top of the image and sketch out a path that the orange robot (mostly) stuck to.